Preliminary Chart of Albemarle Sound North Carolina. 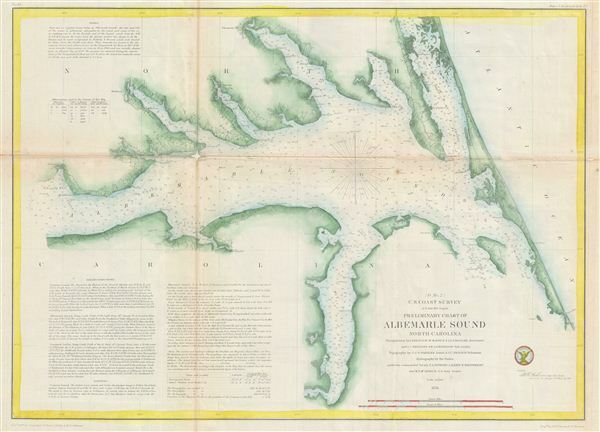 An uncommon 1855 nautical chart or maritime map Albemarle Sounds, North Carolina. Centered on Albemarle Sound, this map covers from edenton, North Carolina to the Atlantic Ocean. Offers beautiful detail throughout inclusive of countless depth soundings and some inland detail. Includes elizabeth City, Nixonton, Hertford, edenton, and Roanoke Island. Shows the barrier islands in considerable detail. Drawn on a scale of 1:200,000. The triangulation for this chart was completed by J. Ferguson, W. M. Boyce, J. J. S. Hassler, J. C. Neilson and A. W. Longfellow (nephew to the poet). The topography is the work of J. J. S. Hassler and J. C. Neilson. The hydrography was accomplished by a party under the command T. A. Jenkins, J. Alden, R. Wainwright, and W. P. McArthur. The whole was compiled under the exacting direction of A. D. Bache, Superintendent of the Coast Survey. Very good. Minor toning on folds. Original fold lines. Closed verso repair on folds. Blank on verso.